One of the hardest things to do when caring for a new puppy is monitoring your puppy’s behavior 24/7. Exploration is crucial to learning and emotional development for puppies and should be enthusiastically supported, but you need to keep a few things in mind to keep your puppy (and your belongings) safe. Puppies generally explore and play with things with their mouths, they go to the bathroom whenever and wherever the urge hits (often picking a specific spot on your newly cleaned carpet), and they can, and often will, chew on virtually everything that fits in their mouths, including carpeting, chairs, couches, shoes and plants. Understand that at this stage of their development, you are 100% responsible for their behavior. This means that if the puppy poops in the house, tears up a pillow, or eats a plant – some of which can be poisonous – it is your responsibility and not theirs. This begs the question: How in the world do you keep the devastation of puppy exploration under control? While you can try monitoring your puppy’s behavior 24/7, I have never seen this actually work. My solution is crate training. Crate training is the process of training your puppy to be comfortable alone in a crate, ensuring both your puppy and your belongings are safe from harm. While some people think of crate training as an imprisonment-like experience for a puppy, this imprisonment is imaginary and is far from the puppy’s actual experience if done properly. This is because puppies naturally value quiet, comfy spaces in which to sleep. So, with regard to crate training, you are merely teaching your puppy where that safe place is. 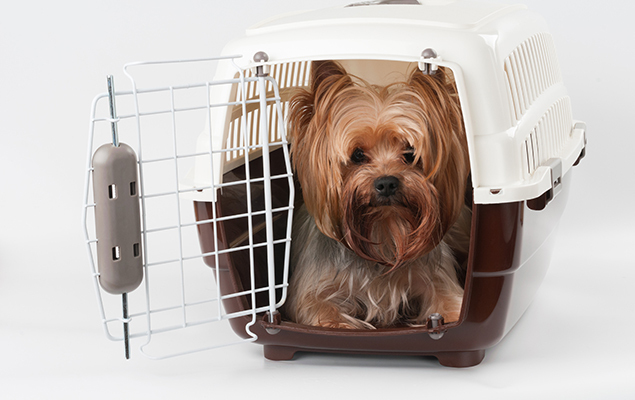 First Step – Teach your puppy that the crate is safe. If you start with a very young puppy (8 to 10 weeks old), you may only have to gently place the puppy in the crate just as they are falling asleep and then shut the door and quietly and walk away. Most puppies, however, need a few additional steps. To achieve our first goal, simply open the doors of the crate and sprinkle high value treats inside the crate. In this case, high value treats are ones that puppies just can’t resist. Dr. Dalton’s Premium Treats fall into this category. They have several additional benefits including leaving no stains, bad smells, or crumbly messes behind. They also easily snap into smaller pieces so that you can use them fairly liberally without over-feeding your puppy. Sprinkle your open crate with small pieces of Dr. Dalton’s Premium Treats, sit back, and let your puppy explore. You may need to put a little treat trail in front of the crate so that the puppy can follow it into the crate the very first time. This is the “safe crate” period, so do nothing other than letting the puppy move freely in and out of the crate of its own accord. Also, while working in this stage, wait until the puppy is not looking and then sprinkle a couple of additional treats into the crate and let the puppy stumble upon them while exploring. This will get them into the habit of walking into and out of the crate to check for treats on a regular basis. Second Step – Teach the puppy that good things happen when they are in the crate. This action of leaving treats in the crate for puppies to find is the beginning of the second step. Here we begin teaching the puppy that good things happen to them while they are in the crate. While your puppy is enjoying the newly found treat inside the crate, gently shut the door while continuing to slip additional treats through the crate for the puppy to enjoy. Leave the door closed for a minute or so at a time, slowly adding more time as the puppy gains confidence in the crate. Do not feed the puppy treats or show them affection if they leave the crate. In this stage, good things happen in the crate, not when they walk out. Third Step – Give the puppy a reason to remain in the crate. Now it is time to give the puppy a strong reason to remain in the crate. You need a special treat that the puppy loves but cannot devour quickly. A raw marrow bone works very well but is messy. Some puppies love rawhide, others love stuffed toys. The only two criteria are that the puppy really wants it and cannot finish it in a short period of time. This item becomes the “crate treat” and only appears if the puppy is in the crate. Now, set up a training situation by putting the “crate treat” into the very back of the crate and entice the puppy into the crate with treats. Leave the door open and sit directly in front of it. When the puppy discovers the crate treat they have two options. First, they can settle down inside the crate to enjoy the treat. If this happens, quietly close the crate door and watch the puppy for a few minutes. Then open the crate, invite the puppy out, and take the crate treat away. Wait a minute and then put the crate treat back into the crate and repeat. When you have done this successfully 3 or 4 times, open the crate, invite the puppy out and take the crate treat and put it away. This treat only comes back out at crate time. Many puppies, however, find the crate treat and attempt to take the treat to another area of the room before settling down with it. This is precisely why you are sitting directly in front of the door. Simply reach out and grab the treat as the puppy is going by (you might have to catch the puppy to get to the treat at first. Simply toss the crate treat into the back of the crate and let your puppy in. Repeat this maneuver 5 or 6 times until the puppy realizes that getting the treat requires that they to stay in the crate. Let them stay in the crate with the treat and then shut the door and leave them for a couple of minutes. Return, open the crate and take the crate treat away letting the puppy out in the process. This maneuver gives your puppy a reason to stay inside the crate. If you have a really great crate treat and your puppy understands that it is only available inside the crate, they will begin choosing to be in the crate with the treat. Simply close the door, move away, and give your puppy time to enjoy the reward. Fourth Step – Help the puppy adjust to the idea that we are not always going to be home – or in the room — while they are in the crate. As soon as your puppy settles down to enjoy the treat, you should leave the room. This teaches your puppy to settle into alone time, and they get used to being in the crate without you. Never open the crate door when your puppy is crying or whining. Instead, move into the room quietly and sit in front of the crate, and the moment the puppy quiets down (even if simply to take a breath) acknowledge the quiet by opening the crate. Then, take the treat and walk away. At this point you might have to go back to exercises 1 -3 to get the puppy used to the crate again. Remember to move forward slowly, take your time, and let the puppy adjust to each step before moving on to the next. Reward the puppy when they go into the crate or stay in the crate, but be calm and reserved when they exit. This teaches them to calmly exit the crate. You need only be reserved for a minute or two before you encourage your puppy to interact with you. A puppy that is crate trained well is very easy to potty train. More on potty training in the blog to come. Part-3: Tips on Training. House Breaking Your New Puppy.